How do you know whether you will like a movie or not? You could read reviews or ask friends – but unfortunately movie critics as well as friends usually have a different taste in movies than you. MovieLens wants to help at this point. MovieLens is an internet project of the university of Minnesota. It can predict for almost every movie how much you personally are going to like it. With this basic feature, it provides a set of other functions like recommendation lists or group recommendations. Searching for new music is still a tricky business. In Discover New Music That’s Perfect for You, I once presented a few recommendation systems which adopted to the personal taste of the user. Critical Metrics walks a different path. It systematically spiders through music reviews in various media. The collected recommendations are then presented at the website. This way, you do not find music recommendations which are selected for you personally, but good music in general. Filtering the music to your personal taste remains your job. You can listen to the music suggestions directly at the site (for free of course). All recommended songs are provided via a flash player in good quality and full length. You can’t download the songs, but there are links to various online shops where you can buy the music if you like it. You can search the musical repertoire of Critical Metrics in different ways. Right at the top of each page is a menu where you can choose different sources for recommendations. You can also choose how up-to-dateness. Besides that, there are search functions and browsing by the providing source (like iTunes). There seems to be functionality for organizing play lists, but I didn’t test it. Personally, I’m having difficulties finding the right music for me at Critical Metrics. This might be the fault of my weird musical taste. :) Nevertheless, I like the idea of this platform. Music is great. Music is manifold. Everyone has his own taste of music. What is loved by one might be refused by the next. These different preferences make it pretty difficult to find new great music. The spectrum is – fortunately – large, but finding the music that appeals to you personally turns out to be like the search for the needle in the haystack. Several internet services have lined up to help easing your search – time to give you an overview of the most important services of their kind. Besides all this fancy new technology, you should not forget those primitive methods to find great new music. You can still ask friends for recommendations, listen in your record store to an unknown CD because it has an interesting name or simply looks pretty. The success rates of these “analog” techniques are surprisingly high. Similar to Last.fm, Pandora is a personalized radio system, but without community features. It does not use a separate player application, but a Flash player on its homepage. Gnoosic, Last.fm and Pandora work with a wide spectrum of music, including that controlled by the music industry. iRATE, on the contrary, has a different philosophy. It only plays free music. Last.fm calls itself a personalized radio. That expression fits Last.fm pretty well. To receive this radio, you have to install a small application. This application receives the music directly from Last.fm’s servers. 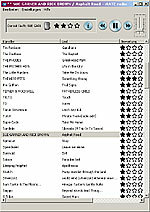 The system keeps track of the music that you are listening to – if you wish even when you’re using other software like Winamp. You can also mark tracks from the radio that you love or never want to hear again.